Would you choose love over friendship? All Lucy Sharnock wants for Easter is a loan to buy her dream café and time to spend with her best friend, Mallory. But when her hopes for the loan are dashed, her mother decides to cheer her up with a blind date. New to the town of Hallston, carpenter and business owner Nathan Frantz, has grown accustomed to the mothers who offer their single daughters up to him like sacrificial lambs. But something about Lucy intrigues him. Their immediate connection hints at something beyond the physical. Unaware they have been set up, Mallory sets her sights on Nathan. As she wants to remain loyal to her best friend, Lucy backs off. When her feelings continue to grow, Lucy will have to choose between the possibility of a future with Nathan, or her life-long friendship with Mallory. 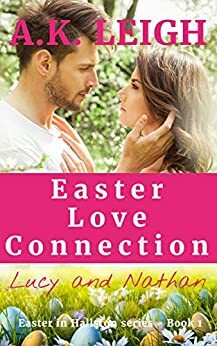 This quick-read, sweet, and clean contemporary romance features no cheating, lying, swearing, or graphic adult content.